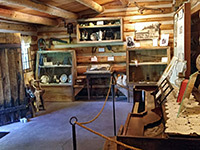 The site of the first pioneer settlement in Nevada is preserved as Mormon Station State Historic Park, at the center of the small town of Genoa, which sits at the foot of the Carson Range in the far west of the state, 12 miles south of Carson City. The buildings survived until 1910, when they were completely destroyed by fire, but a full replica was constructed in the 1940s, and the place was transferred to the state in 1957; it consists of several wooden buildings separated by lawns, walkways and tall trees, along a quiet, mostly residential street. 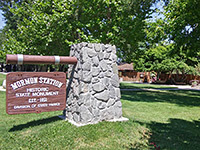 The original settlement served as a trading post and rest stop, catering to cross-country travelers along the California Trail (the Carson Route), which entered the mountains a short distance south, at Woodford Station. 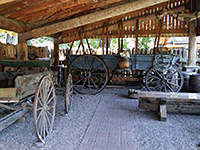 The main building houses a museum, filled with relics from pioneer times; other reconstructed areas include a stockade and wagon shed. The grounds of the park are always open, free to enter, and are popular for picnics; bbq grills and a group pavilion are available. Museum opening hours vary during the year, and a nominal fee of $1 per person is charged. The park has a central location in Genoa by the junction of Main Street (Hwy 206) with Genoa Lane (Hwy 208), opposite another historic site, the Genoa Courthouse Museum. This part of town is peacefully situated and has scenic surroundings, with forested mountain slopes rising up just a few hundred feet west. The area in front of the park has shady pathways and a California Trail marker, while the buildings are on the far side of a wooden fence. 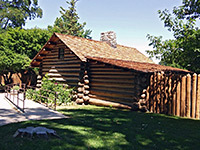 The first permanent structure at Genoa was a small, roofless cabin, built in 1850 by two Mormon settlers (Hampton Beatie and Abner Blackburn) as a base from which to sell provisions. 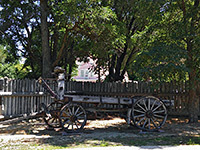 This was enlarged the following year, now owned by John Reese from Salt Lake City, with later additions of a hotel, stable and blacksmith's shop. The settlement became unofficially known as Mormon Station during the next few years, until changed to Genoa. The hotel and the store continued to operate through the 1860s, during which time the state of Nevada was created from the western part of the Utah Territory, and Genoa was made the seat of Carson County. Trade declined in the following years but the post was still in operation when the great fire occurred, on 28th June 1910, destroying all of the station and the adjoining two blocks. Some of the other affected businesses were quickly rebuilt, but in 1916 the county seat was transferred to Minden, causing Genoa to become more isolated, and the town has remained small ever since.